Stage drapes are designed to mask backstage areas, as well as camouflage performers and props that are set on the stage. The stage curtains are made from thick, light-absorbing fabrics to give aesthetic appeal to all stage performances. Continue reading the article to find out all about stage drapes and where you can find best quality stage drapes in India. Material: The material of the fabric depends on the type of stage and the amount of heaviness you want to provide to your stage curtains. Curtains made from fire retardant material are able to resist accidental fires. Velour is one such fabric that resists fire due to its thick material and light-absorbing properties. 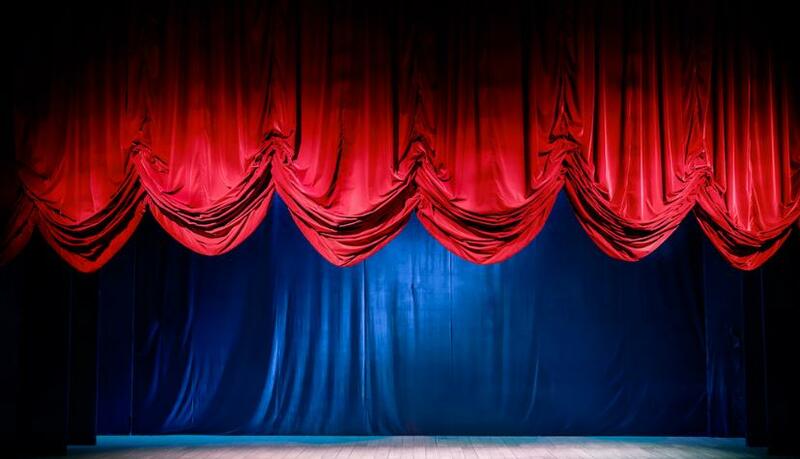 Other materials that can be used for stage curtains are cotton, synthetic and vinyl. Thickness: The thickness of stage curtains is good for hiding performers as well as props before for the show. Besides shielding the stage, the curtains also create suspense and excitement to audiences. Thick fabrics of drapes are usually preferred in dark colours such as black and deep burgundy due to their light-absorbing properties. Style: The way stage curtains drop and disappear create a beautiful effect before and after the performances. There are various style of stage curtains with parting from the middle, from top to bottom, or from the bottom upwards. In addition, the drapes even assist in demarcating the scenes of the act. Light absorption: For good light absorption, dark curtains are preferred. These curtains ensure performers and props are not visible to the audience before a proper stage set up. Sound insulation: There are certain curtains that come with sound insulation properties. Due to this unique property, such curtains are able to help in improving theatrical acoustics and provide better stage insulation. Decorative: Stage curtains also function as decorative elements for the stage. The way curtains fall or disappear from the stage has a regal and majestic impact on audiences. Stage curtains are still being preferred in auditoriums, as these pieces of cloth continue to create a grand impression even today, as compared to the simple drop down screens. Use: Stage curtains are used almost everywhere in theatres, cinema halls, churches, chapels, schools, colleges, auditoriums, opera houses, etc. Usually, in school and colleges, simple stage curtains are installed, but in big theatres and grand cinemas you can find grand and magnificent stage curtains. Whether you're looking for custom-made curtains and drape systems or stage equipment, you can also contact consultants at Stage Curtains for complete guidance.